Our dental practice highly values each individual patient and their specific dental care needs. In order to provide a treatment that best works for you and your unique mouth, we offer fixed dental bridges in NC. This type of dental bridge is secured into place and can only be removed by a professional dentist. Fixed dental bridges are sometimes called partial dentures, as they are fixed to existing teeth or attached to dental implants. When you visit Carolina Dental Arts for a teeth bridge in NC, we first prepare your abutment teeth to accept the bridge by contouring your teeth and removing a small portion of enamel to make room for a crown. Next, we make impressions of your teeth that are used as the model for the dental bridge. While your tooth bridge is being customized, we’ll make you a temporary bridge that is easy to wear and protects your exposed teeth and gums. Then, you’ll come back for a second visit to remove the temporary bridge and place the new one. Over a few weeks, we’ll make necessary adjustments to ensure it is a perfect fit. 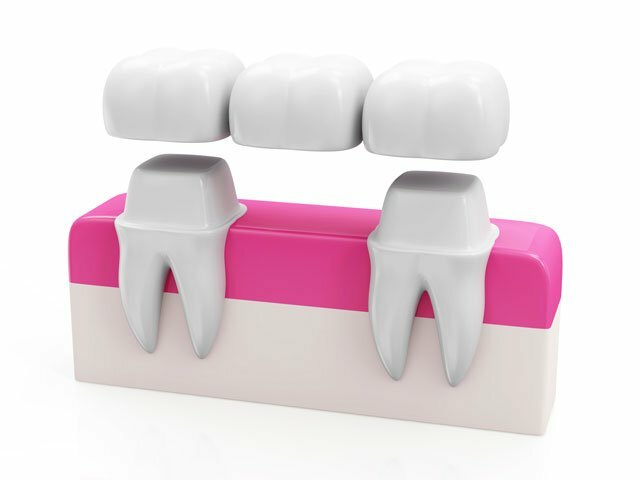 If you select to have a fixed dental bridge, it will be permanently cemented into place. If you have questions about our NC dental bridge cost or are wondering if this procedure is the right treatment for you, our restorative dentists would love to talk to you. Feel free to contact us today at a location near you.